This is part 2 of a very condensed life of Moses. Following Acts, I do several lessons with Old Testament people to discuss the old law vs. the new law. What rules God tells us in the New Testament He expects us to follow. When Jesus died on the cross, God instituted some changes. Some of those are talked about in Acts 10:1-48 when we talked about Cornelius and Peter's vision. 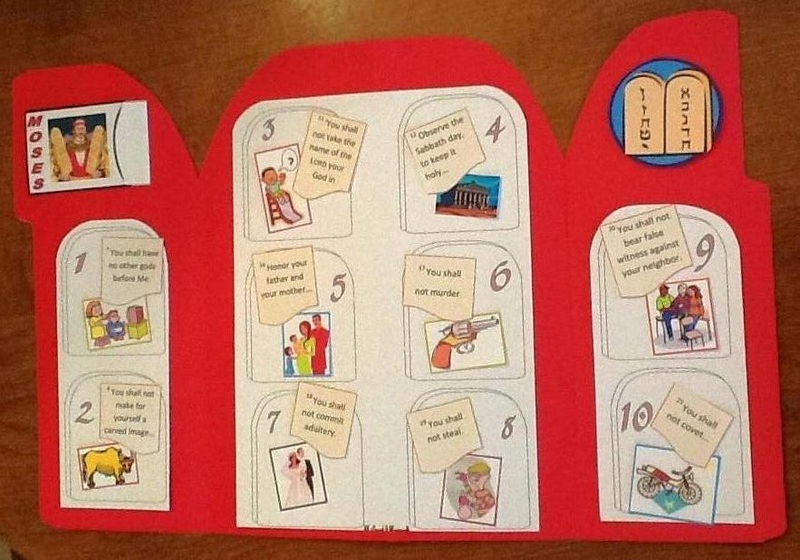 We are doing several lessons on the old laws and the new laws in the Bible. Remember, the new laws start in the New Testament after Jesus died on the cross. Paul talks a lot about the laws in the book of Acts. 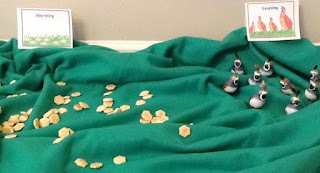 Last week we talked about Moses and the 10 plagues. He guided the people out of Egypt with his brother Aaron. God was with them. After the last plague, Pharaoh finally decided to let the people go, but changed his mind when he thought about all his workers being gone. The Israelites were really scared when they saw Pharaoh’s army coming after them, but Moses said that God would fight for them. (14:21) Moses stretched out his hand over the Red Sea and God sent a very strong wind from the east. The water rose up and divided and the Israelites walked across the Red Sea on dry land. Moses stretched his hand back over the water and the water went back down. The Red sea covered all the Egyptian men and chariots! (14:28) Every single one of them! As the people traveled, they complained about food. God sent quail every evening for them to eat and in the morning, there was dew on the ground. We collected 'manna' and they LOVE this! When the dew lifted, it was bread called manna. They were only allowed to pick up 1 omer per person in their tent. God would provide it every day, except for the seventh day. If they saved any extra manna, it stank and had worms coming from it! The manna tasted like a wafer made with honey. (17:31) This is what they ate for 40 years while they were wandering in the wilderness. Three months after the Israelites left Egypt, they came to Mt. Sinai. It was completely covered in smoke. God was there and no one was allowed to look on Him. 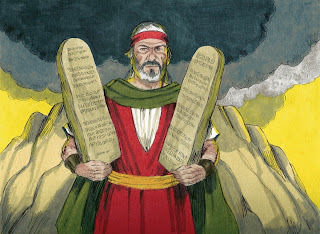 God gave Moses the rules He wanted the people to follow. They are called the 10 Commandments. They were written on both sides of 2 tablets of stone by God’s own finger. (31:18; 32:15) And, remember, they are the old laws from God. (20:3-17) We are going to talk about them in just a minute. While Moses was on the mountain getting the rules, the people were breaking them! 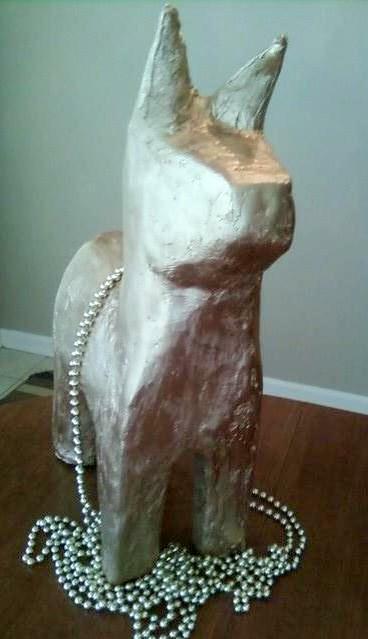 This gold calf is a piñata! I used the pottery plaster from Hobby Lobby and then spray painted it gold. The gold beads are the long Christmas string beads. This idea was also from the Teacher's Workshop! They gathered together and brought their gold earrings to Aaron. He melted it all down and carved a gold calf. They built an alter and worshipped it! After all that God had done to keep them safe! When Moses came down from the mountain, he was so angry at them; he threw the tablets down and broke them! 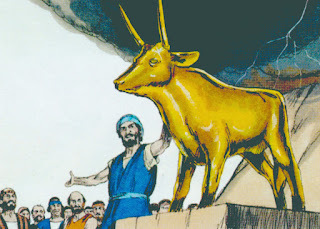 Moses took the gold calf that they had made, melted it down, and ground it into powder. He put it in the water and made the people drink it! 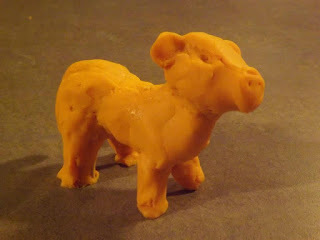 When Linda Hahn Zaveson looked and could not find a cow to paint gold for Aaron's 'gold calf', she made one from Play-Doh! It is awesome! 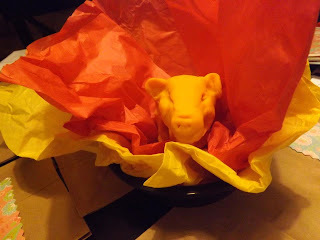 And, "Then we tore him apart and threw him in the fire! The kids loved it! (especially tearing him apart! LOL)"
That looks like a fun way to teach it! Thanks so much for sharing the pictures, Linda! 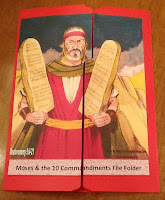 Today is a 10 Commandment file Folder Game (FFG). 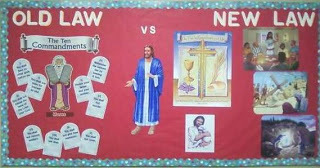 I've been doing FFG's in the Bible classroom for years, back when the idea first started and I made the designs myself! They love them, and a lot of the kids say "I still have that ____ FFG!" That's nice to hear! I know there are a lot of 10 Commandment FFG's out there, but here is my version. It will work best if you have a folder with the tab at the top (first pic). I print everything on cardstock, and use Aleene's Tacky glue to glue it. 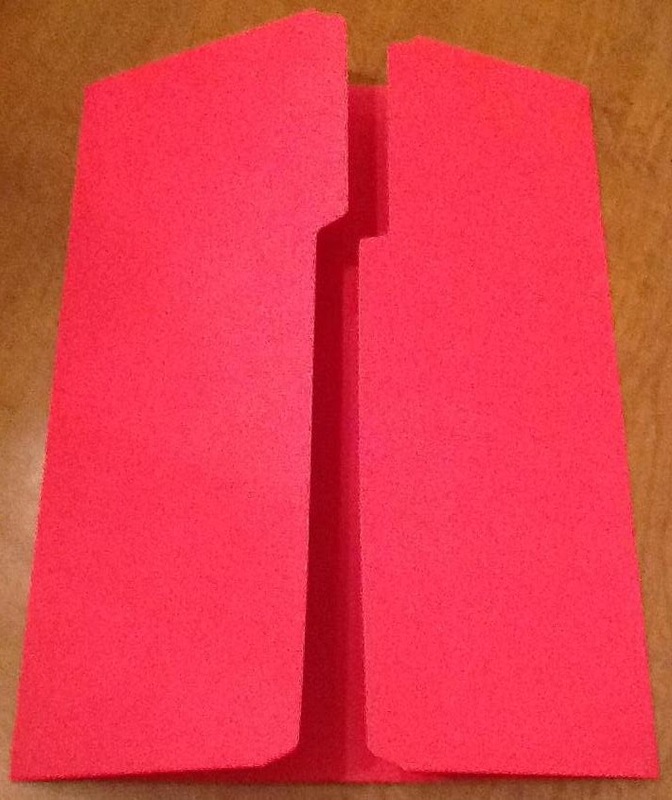 If you see on the second picture, I held the cover picture to one side of the folder and held it up the light. I made sure it was straight along the edges, and I tried not to cut on Moses' face. Then, I turned it over, carefully so I didn't shift it and traced the cut line. Once that is done, cut and glue on the front cover. It should look like the above photo. Next, I used a round plate (or whatever) to round off the edges. (1) to have blank numbered stones and cut and glue the scripture and graphic to the correct one. Click here to download. (2) You just cut and glue the scripture (The graphic is already with the correct number). 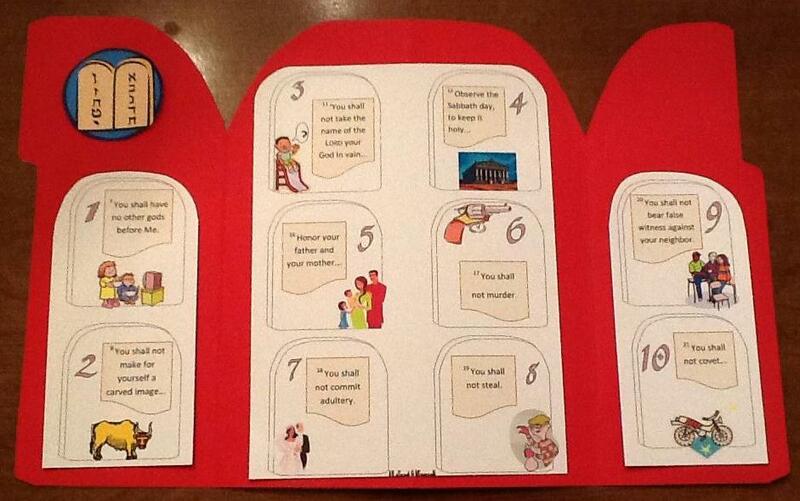 You can also use the 10 commandments stickers (instead of the printable scripture) from Oriental Trading. You can print this option here. And (3) You can add a pocket and play it like a game so you can reuse the parts. When you are finished sorting and playing the game, all the parts are stored in the pocket. The pocket needs to be glued at the top with the largest section. (see photo) You can print this one here. There are several different packages put together to make this one board. You can see the right bottom scene here. Click here to print Moses and burning bush, Pharaoh, and Moses' family. 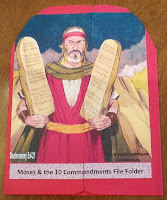 Here is a review Moses worksheet. 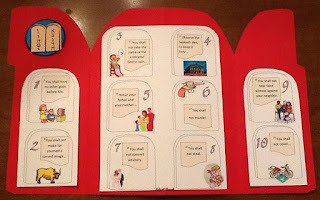 There are 2 bulletin boards for the condensed lessons for Moses. 5. Honor father & mother. Click here to see more for the 10 Commandments including a set of visuals. Sister Your Blog is very useful to us. I am working as software professional (India – Puducherry). In our Sunday school children to explain the some of the bible topic we will use your blog document. Thanks for your effort ,Quality document and take one step ahead to share in document in web. Thanks for stopping by! I appreciate the nice comment and thank you for the invite. I added this post also to Look What We did. Just found your site - LOVE all your ideas! It has already been a big help and I know it will be a resource I'll return to often. Thank you for sharing! Thanks so much for the nice comments! I appreciate it! Thanks so much for the nice comment! I am glad you can use the project! Thanks for stopping by, I appreciate it! Deb I'm going to teach the 10 commandments this coming Wed night. I think I'll use Velcro dots to let them take them off and on so they can learn the 10 commandments in order. I'll let them take them home with them but may make one for class to use for a game. They loved the on hands type of teaching instead of looking at a flip chart story. 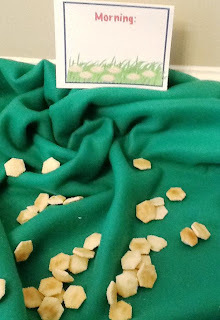 I think I seen where someone used rice crispy treats shaped like 10 commandments. thanks for sharing your ideas. Thanks for the ideas Crystal!